You need to have a microSD card 2GB or bigger. Don’t update your touch panel firmware if you want dual or triple-boot. Read CM10.0 Jelly Bean for Nook Tablet if you want to downgrade the firmware. Not all microSD card brands are made equal. I always recommend SanDisk due to fast small block random write. Only CM10 support 5-touchs/10-touchs driver currently. CM10 currently have problem with SDCard dismount when device goes to deep sleep. This causes the device to not awake when turning it back on. You have to hold the power button for 20 seconds and then power it back on. You need to have a SDCard 4GB or bigger. The default steps are for 4GB sdcard. For sdcard bigger than 4GB, you need to make adjustments. Data partition stores your apps, so you want at least 1GB. System partition stores your system files and apps, 350MB – 400MB is all you need. SDCard partition stores your boot files and misc. files so the larger the better. If done correctly, your Nook Tablet should boot to fattire’s Cyanoboot, if not, nothing. If you are stuck at the two androids when booting CM7 for over a minute, boot into CWM Recovery and wipe cache partition. If you can’t get wifi working in CM7, it mean you used the wrong cm7.img. 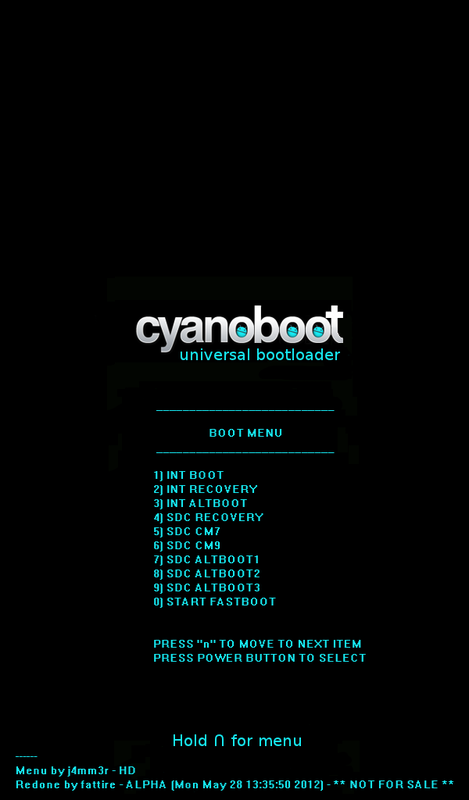 New Boot Menu with altboot1 – 3. They are for partitions system3 – 5/data3 – 5 if you want quintuple boot. Not all sdcard brands are made equal. I always recommend SanDisk due to fast small block random write. Added file for CM9 Alpha 0.05/0.05.1. You can mount both sdcard and emmc now.